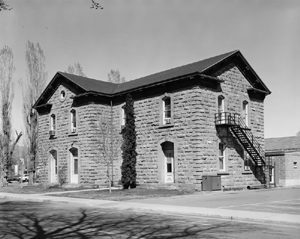 Nevada State Prison (NSP), is located in Carson City, Nevada. 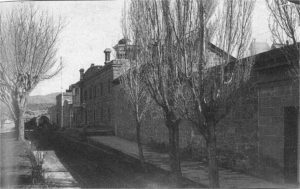 The prison was in continuous operation from its establishment in 1862 until its closure in 2012, a period of 150 years. 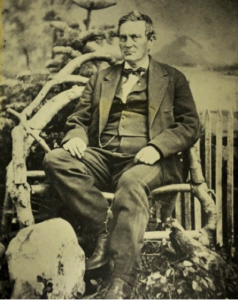 Abraham Curry was one of the first, and certainly the most important settler of Eagle Valley, the site of Carson City. He arrived in the valley in 1858 from Utah and purchased the Eagle Ranch for $500 and several mustang horses. 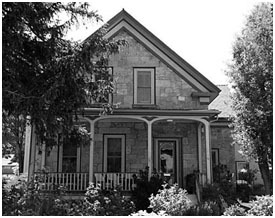 On this property he built the Warm Springs Hotel, using the sandstone rock quarried on the site. 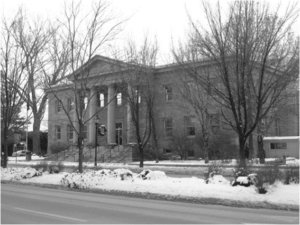 In December, 1861, the first Territorial Legislature met at the hotel and created the Board of Prison Commissioners. This Board was authorized to lease the property adjacent to Curry’s hotel effective January 1, 1862. 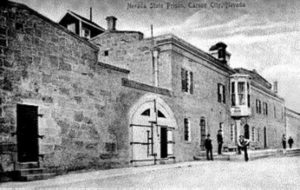 This is the date for the establishment of what was to become the Nevada State Prison. Curry was also appointed as the first territorial warden of the prison on that date. 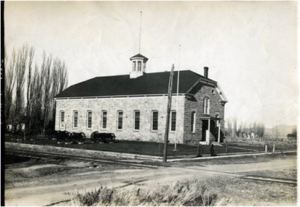 The Territorial Legislature subsequently authorized the purchase of the 20 acres being used as a prison, including the quarry. This purchase was to be effective on March 1, 1864. Curry was given $80,000 in interest-bearing bonds for the property. 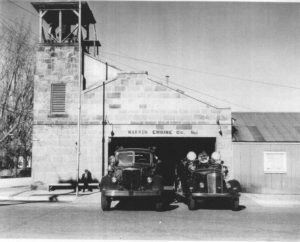 On May 1, 1867 a fire occurred at the prison, with total loss of all buildings, and all prison records. The buildings were rock and mortar structures, covered with dried wooden shingles. It was assumed that the inmates set fire to their shed-like housing. 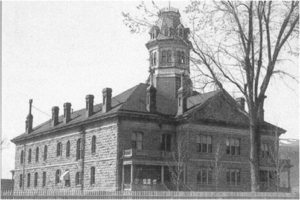 In 1870, another fire occurred and a major portion of the institution was again destroyed. 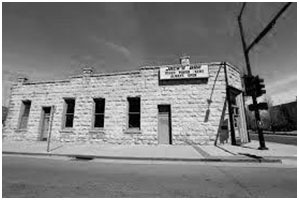 This incident resulted in a construction project using quarried stone on site and inmate labor to build substantial structures. On September 17, 1871, the most dramatic event in the history of the prison in the 19th century occurred. The Captain of the Guard was attacked while locking the inmates into their cells on this late Sunday afternoon. 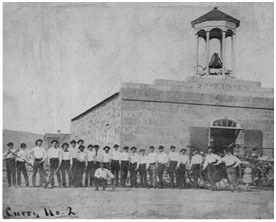 Twenty nine inmates participated in this escape, acquiring guns from the armory, shooting Lieutenant Governor Frank Denver and several guards, killing two people. Most were recaptured; two were hung by a posse, and the ringleader was never found. Convict Lake in Mono County, California is where the escapees made their last stand. The following year, 1872, legislation resulted in the repeal of the portion of the Constitution which established the prison as the responsibility of the Lieutenant Governor. 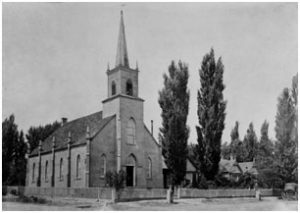 A new warden was appointed, but Lieutenant Governor Denver refused to hand over the institution and refused to allow the Governor, or any other members of the Prison Board, to enter the prison. Finally, the Governor called out the militia in March, 1873. 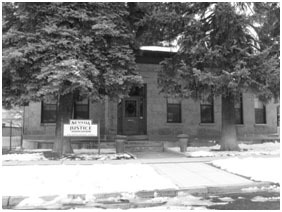 Confronted by 60 soldiers and a small artillery piece, Denver surrendered the institution. The primary means of support for the prison during the 19th century was the shoe shop where inmates were engaged in the construction and sales of footwear. In addition, the institution obtained funds through the quarrying and dressing of sandstone taken from within the perimeter of the institution. 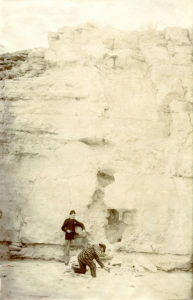 Although it was not the major source of income, the quarry had the most profound and lasting effect on the face of Carson City. 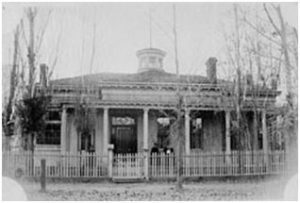 Public buildings and homes throughout Carson City reflect the prison as the source of the substantial construction material. In the late 1870s inmates working to quarry stone in the prison discovered the fossilized footprints of prehistoric creatures. 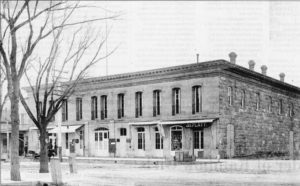 In 1882, the Carson City Sheriff communicated the discovery of the footprints to the California Academy of Science in San Francisco. The footprints were correctly identified as La Brea Fauna of the Pliocene era, but were attributed to a previously unknown race of giant humans. At that point the prints were estimated to be about 2 million years old. Varied interpretations of the origin of these mysterious impressions fueled academic controversy and varied attribution from giant humans to giant sloths. In the end, the sloth advocates won out in 1917. Other prints include mammoths, native horses, large birds, dire wolves, and the sloths, big-toothed cats, elk and deer. As late as 2013, scientific study has been carried out on footprints uncovered to the South of the License Plate Factory. While the fossil grotto may be compromised, the general area is a rich site of historic significance, suitable for scientific research and demonstration. 1923 Leonard Fristoe and two other inmates accompanied Warden Tom Slater in the warden’s car on a trip to Reno. Left unattended by the warden, Fristoe walked away and was not heard from again until 1968. He was arrested in California after a domestic disturbance and returned to NSP. His escape lasted for 45 years. 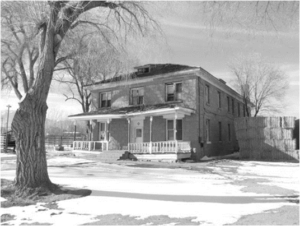 This was the longest escape and recapture in U.S. history until 2015. In May, 1970, Fristoe received a pardon and was released based upon the split vote of the Pardons Board. 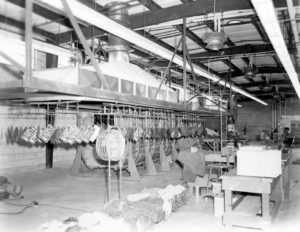 In 1928, NSP became the site for state automobile license plate production. Until the advent of modern screening techniques, the license plates were stamped and painted using dies and stamps that were operated by trusted inmates. Today the “Tag Plant” is at another prison. With the legalization of gaming in Nevada, the Prison apparently saw no reason not to allow inmates to participate in organized and sanctioned gambling. 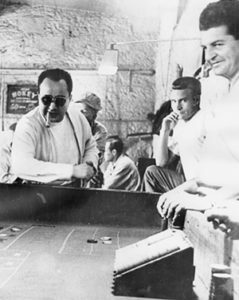 Wardens provided space for gambling games and establishment of inmate game “owners”. This practice is astounding to modern correctional practitioners, as it legitimized an underground inmate economy with the attendant negative opportunities for indebtedness between inmates, coercion, and inmate control of other inmates. 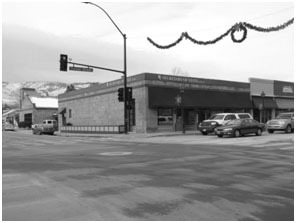 The hiring of a core of professional administrators in 1967 resulted in the closure of the “casino”. Perhaps as an adjunct to the gambling, NSP coined its own money. This money took the form of brass coins of $5, $1, and 50, 25, 10, and 5 cents. These coins were minted from 1945 to 1964. Their use resulted in the phrase “brass” in the prison lexicon, meaning “money”. 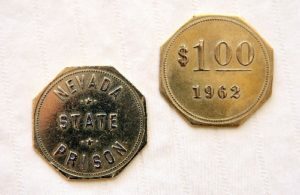 Today these coins are collectors’ items and given to long serving prison employees upon retirement. 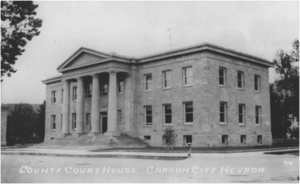 The 1901 state legislature required that all executions be conducted by hanging at the state prison in Carson City beginning in 1903. The first inmate executed at the state prison was John Hancock on September 8, 1905. 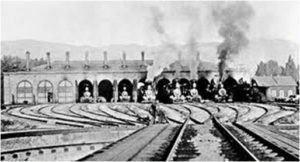 The largest multiple execution in the history of Nevada occurred on November 17, 1905 when four men, Thomas F. Gorman, Al Linderman, Fred Reidt, and John P. Sevener, were executed using double gallows for the murder of a transient they threw off a moving train while they pilfered the box cars. Two Native Americans, Indian Johnny, a Shoshone, and Joe Ibapah, a Goshute, were executed using double gallows on December 7, 1906 for the murder of a transient. 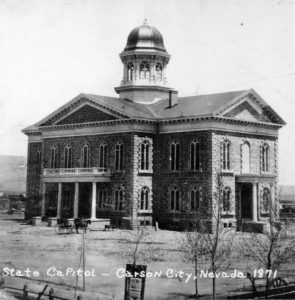 The Nevada State Legislature passed a law in 1910 allowing condemned inmates to choose between execution by shooting or hanging. Andriza Mircovich was the first and only inmate in Nevada to be executed by shooting. In 1921, a bill authorizing the use of gas was passed the Legislature. Ten men had been hanged at NSP before the law was enacted. Condemned murderer Gee Jon, of the Hip Sing Tong criminal society, became the first person to be executed by this method in the United States. 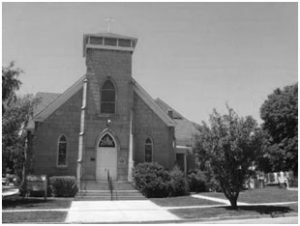 Thirty-two men were executed in Nevada’s three gas chambers between 1924 and 1979. In 1983 the State Legislature changed the method of execution to lethal injection. On December 6, 1985, serial killer Carroll Cole became the first inmate to be executed in Nevada by lethal injection. The last execution in Nevada was in 2006. A total of 12 men have been executed by lethal injection. In December of 2016, the execution chamber at the Ely State Prison was completed. Henceforth, executions will be carried out there. 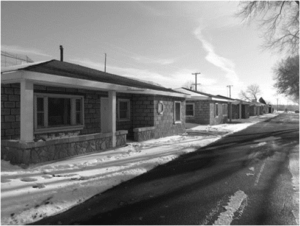 The Nevada State Prison remained the only state prison until the Department of Prisons expanded in 1964 with the opening of the Northern Nevada Correctional Center on the prison farm property in the Stewart area of Carson City. 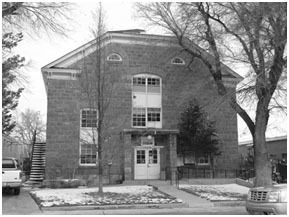 NSP operated as the state’s maximum security prison until 1989 when the Ely State Prison was opened in eastern Nevada. 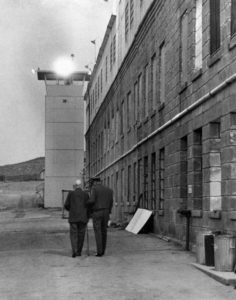 The decades of 1970 and 1980 were characterized by inmate violence and legal challenges to an antiquated corrections system. The institution witnessed several murders of inmates, high profile escapes, numerous hostage incidents, and attacks on staff. NSP also became troubled by racial tension and the rise of prison gangs. The operation of the prison became an issue in the gubernatorial election campaign of 1982, contributing to the defeat of an incumbent Governor. 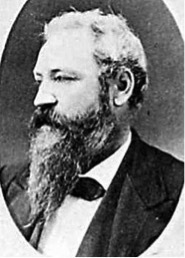 Ultimately, control was regained by the hiring and influence of a “Town-Tamer”, the former warden of San Quentin, George Sumner. In the 1980s, NSP was expanded onto the northeastern bluff. These new housing units proved to be poorly designed, with obstructed lines of site and minimal opportunity for inmate supervision. 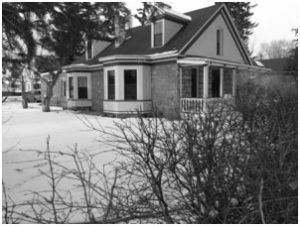 These flaws, along with the deterioration of the original infrastructure, encroaching community, and the disordered perimeter resulted in a phased closing of the institution. The prison finally closed its doors on May 18, 2012.